Spring is certainly one of the best times of year and no matter which type of garden you have, the chances are that things will now start to grow more efficiently. However, to help care for your lawn, plants and flowers need to have water and for them to blossom, you need some sort of sprinkler system to make this possible and spur on the growth process. While it is easy to find many different methods to water your garden, the underground sprinkler system is definitely one of the most convenient. You don’t need to water your garden for hours with a hose or watering can, but rather just turn on the sprinkler system to do everything for you. It saves you time and some water. In this article, we look at how to make your sprinkler system perfect for the coming spring months and why it is important to actually get a head start. If you don’t have a sprinkler system and you love your watering hose, you can still use many of these tips. However, it might be a little more daunting and timely to do. You need to get a head start if you want to capitalize on the spring season and this does not only relate to setting up your sprinkler to work before spring starts, but also watering the soil to ensure your plants are fully hydrated with enough sunlight that will help them grow more efficiently as spring makes a comeback. Many plants have a tendency to actually blossom at the start of spring once the season is turning and some people never actually get this experience when they only set up their systems a little too late after spring has already started. However, you can start implementing some of these changes while winter is letting off and the last cold front has passed. Chances are that your sprinkler system might have been already set up from the previous season and you haven’t really been using it during the winter months. Before simply turning it on, you should obviously run a check to ensure the system is still working and this can be done in around 2 hours if you understand gardening. One of the first things that you will do is dig a hole in the ground that is around a foot deep. Once you have done this, you can check to see if the soil is still frozen. After an extremely cold winter, you might find the soil still frozen for a couple of weeks until the sun actually starts coming back out to thaw the ground. Frozen soil will not make it easy for you to use your sprinkler system and this is where you will need to get a head start. Using the old watering hose is an effective way to ensure your plants still have water. However, it serves a double purpose and could potentially even thaw some if the ice in the soil to get your sprinkler heads ready. 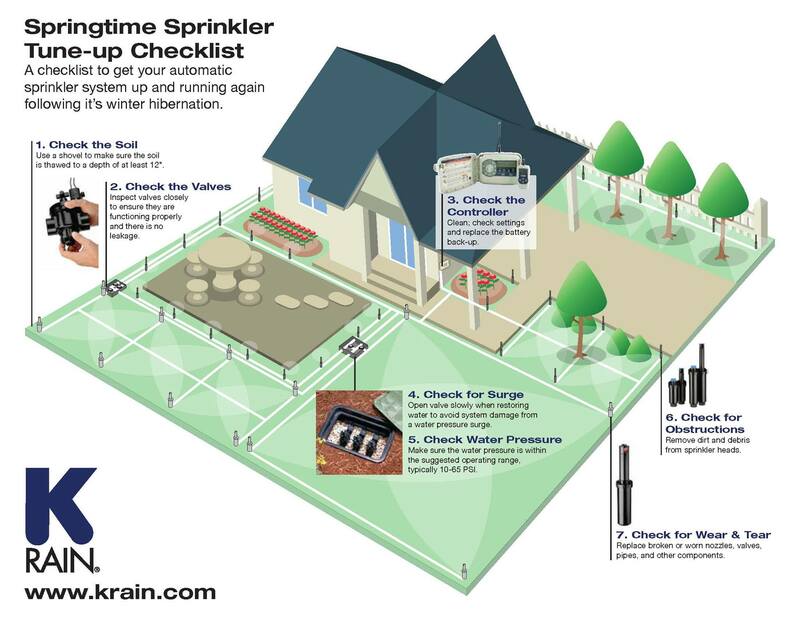 While the ground is still thawing and you wait for spring to fully set in, you can use the time to do some much-needed maintenance on the sprinkler system. This might not always be necessary, but why not take some time to check, you could potentially remove a potential snag before it becomes something more sinister. The batteries on the control panel might be getting old and to have your system work efficiently, you can take the time to replace them. You also need to look at the date and the settings that work with your planning. Many of these need to be readjusted for the spring months to ensure your plants and your garden gets water at the right time. Lastly, the sprinkler heads themselves are fundamentally important when it comes to maintenance. If you need to use them, they should work, but often times they might be full of cobwebs when left for a while. You should take some time to remove some of these cobwebs and to thaw the ice that might still be trapped inside. If not, you might find yourself dealing with a burst pipe before the spring season has even started. Once all the maintenance and the hard work is done, you will have full reign to start using the system. However, we do recommend actually testing the system before you set it on some sort of automatic schedule. This will help you detect any flaws or problems that you might have missed during the maintenance process. The irrigation zones might not need any changes, especially if you have not made any real garden or landscaping changes from the previous years. It is best to simply activate one of the zones and have a look to see if everything is functioning properly. If it does, you can work through each of the irrigation zones to ensure they all work. If you have made a few landscaping changes, you might need to refer back to step 1 and 2. However, you could also choose to have a professional come and assist you with the new set up. It might cost you a couple of bucks, but you will definitely get some great results from your irrigation system and also have the maintenance done for you. Once all of this is done, your system should be ready to be used for the spring season. You will be ahead of the rest and your garden could even stand out in the neighborhood. Simply follow these steps and ensure that all the maintenance has been done and you won’t have any real issues for the spring season. Let us know in the comment section if these tips have worked for you and if we might have missed any other great tips that could help with irrigation this spring.